RIIAB means Residual Income In A Box. It’s a system with Member to Member Payment. That means that it is direct payment to personal accounts. It’s a cooperative system with Member to Member Payment. That means that it is direct payment to personal accounts and not to any third party or admin or internet site. RIIAB Feeder Matrix offers different matrices. 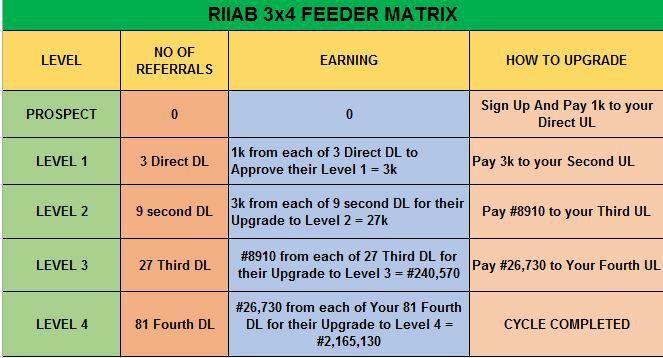 However, the one I am introducing to you is 3×4 feeder matrix where you register with NGN1,000 only and refer ONLY 3 people. It has 3 people on a level and ends at level 4. RIIAB is completely a unique business in the sense that there is no central account, no company will collect your money. It’s basically a member-to-member transaction. All you need to be part of it is just N1,000 only. You pay it to the bank account of the person that refers you to the business. That person is the one that will approve your registration after receiving alert of your payment to his/her bank account. After payment, you will refer 3 people to join under you, your total earning is N3,000. Once that’s done, your upline will approve you to level one. Then you can start registering 3 people under you. You will use the N3,000 you earn at LEVEL 1 to upgrade to LEVEL 2. This time the upgrading money goes to the upline of your upline (The person who referred your upline ). You will then take that 3k send it to your SECOND upline. Once that’s done you can then purchase AdPack 3X4, $9. Afterwards your SECOND upline will approve you for level 2 (this is why it’s important to know all your uplines). Your SECOND Upline upgrades you to level 2. EARNING AT LEVEL 2: Your Second Downlines (9 people) will pay you N3,000 each, to upgrade them to level 2. Total = N27,000. HERE IS WHERE THE BUSINESS SKY ROCKETS! After earning N27,000 from your Second Downlines, pay #8,910 to your THIRD Upline. Once that’s done you can then purchase AdPack 3X4, $27. Afterwards your THIRD Upline will approve your upgrade to level 3. Your THIRD Upline upgrades you to level 3. After earning N240,570 from your Third Downlines, pay N26,730 to your FOURTH Upline. Once that’s done you can then purchase AdPack 3X4, $81. Afterwards your FOURTH Upline will approve your upgrade to level 4. Your FOURTH Upline upgrades you to level 4. Everyone takes turns until everyone in a team has earned, then you restart. If you really engage your heart to work on this, you can generate a total of N2.1million within few weeks/months. NOTE: DL means downlines while UL means upline. Dear reader, how does this sound to you? Simple! Yes, of course. It’s a new innovation in MLM. No buying, No selling. No experience needed! Simply networking with just N1,000 once off payment. All you need is a working Gmail account, your desired username and password with which you will register, and N1,000 only.